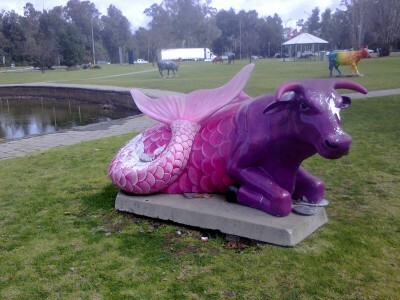 One of the most surprising, unique, and engaging things to do in Shepparton is to view the wildly decorated cow sculptures that are positioned throughout the town as part of the city’s MooovingArt outdoor art displays. For the past week we’ve had a visitor from America staying at the Hurlstone Homestead B&B and she was “udderly” thrilled when she “herd” that Shepparton had a crazy cow outdoor exhibition just like some cities back home in Texas. We put a collection of her most “amoosing” cow photos on a Pinterest pinboard. You can click on any of the photos in this post to see them all.